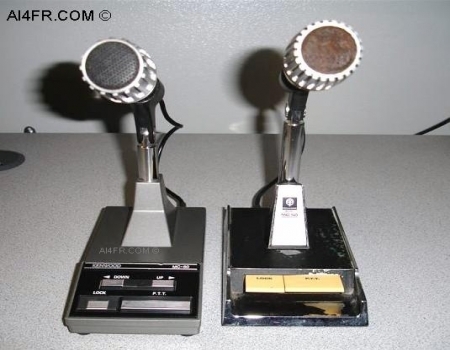 The Kenwood MC-50 and MC-60A has been a popular desk microphone among Kenwood owners for many years. 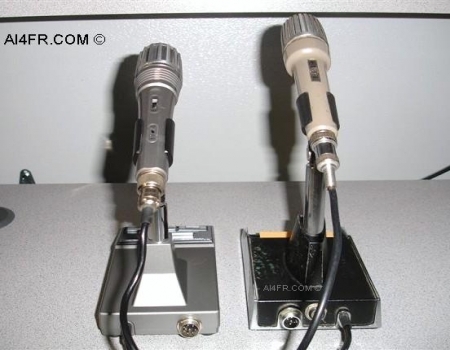 They both have a communication type dynamic and unidirectional moving coil microphone element. The MC-60A employs a "feather-touch" switch design on the base, while the MC-50 incorporates a piano key style of switches on the base. Both microphone designs have a PTT (push to talk) switch as well as a lock feature for extended transmissions. Both microphones also have a PTT lock switch on the microphone body. The MC-60A has an added rocker switch on the top of the base for the UP and DOWN tuning of compatible Kenwood transceivers. The microphone impedance may be set for 50K ohms or 500 ohms on the MC-60A, and 50K ohms or 600 ohms on the MC-50. To select the different impedance settings on the MC-60A, all one has to do is flip a switch on the top of the microphone body. The procedure differs some what on the MC-50 in that the operator of that style of microphone will need to unplug the microphone cord at the base and turn it 180 degrees. Most of the Kenwood HF products are 50K ohms, while all of their mobile VHF and UHF radios have a 500 ohm impedance. Some of the Kenwood HF radios can operate from either of the two impedances. Either way, Kenwood recommends that the operator speak at a minimum distance of four inches away from the microphone. The frequency response is 150 Hz to 10 kHz (-6dB) on both microphones. The MC-60A has an added preamp and when this item is engaged, the frequency response is 200 Hz to 7 kHz (-6 dB). 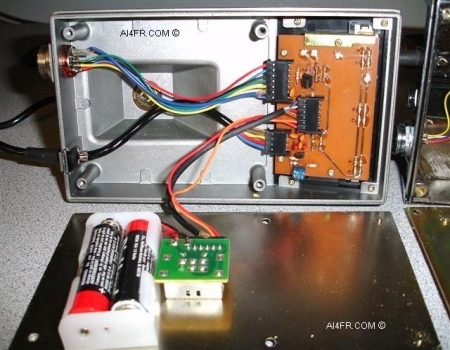 The preamp requires two AA cells which are mounted on the inside bottom of the base. The MC-50 does not have a preamp. Each design incorporates a heavy zinc die-cast base which provides for extra stability. This page was originally planned to showcase just a single MC-60A microphone from those that I had laying around, but then I thought that since I also had an MC-50, why not put the two together for a side by side comparison. In both of the photographs above, the MC-60A microphone is on the left. In the photograph on the right the black paint on the base of the MC-50 has started to wear thin from the many years of use. Important note: Kenwood also manufactured an MC-60 microphone without any letter suffix. This microphone is essentially the same as the MC-60A except that it does not have the preamp circuitry and the associated components. Every MC-60A microphone that I have ever owned has been marked MC-60. 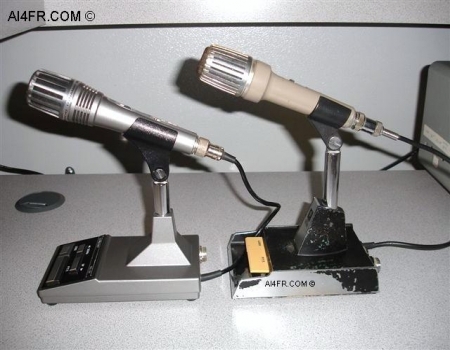 The photograph on the left is a side by side comparison of the rear of the two microphone designs. The MC-60A is on the left and the MC-50 is on the right. In this picture we can see that there is an extra switch found on the top of the microphone body of the MC-60A. The MC-50 has only a single switch on the top of the microphone body whereas there are two on the MC-60A. As discussed in the text above, this extra switch allows the operator to easily and quickly change the impedance of the microphone to either 50k ohms or 500 ohms. Having the means to change the impedance allows the microphone to be used properly with most transmitters. The single switch on the MC-50 has the same function as the first switch on the MC-60A which is to lock the microphone into the transmit position. You might be thinking that this additional lock switch on the microphone body of each design is redundant due to the base having this option as well. Some operators, for many reasons, end up removing the microphone body from the base and install it in, say, a boom type of configuration. Having the switch on the microphone body allows the operator to lock the microphone in the transmit position, which is useful for extended transmissions, even if it has been removed from the base. The Kenwood engineers most likely had this configuration in mind when they decided on a location for the impedance switch. To change the impedance on the MC-50 is a touch more complicated then the MC-60A, but it is still easy to accomplish. The operator of the MC-50 will need to unplug the microphone cord at the base and turn it 180 degrees. Matching the red H-mark on the microphone connector to the red mark on the base sets the impedance to 50K ohms. Conversely, matching the black L-mark on the microphone side to the red mark on the base input cord side sets the microphone impedance to 600 ohms. This same procedure is also used when the microphone is employed separately from the base. The picture on the right is of the bottom of the two microphones. The MC-60A is on the left while the MC-50 is on the right. In this picture take notice of yet another switch that is found on the MC-60A that the MC-50 lacks. This switch on the MC-60A allows the operator to turn on and off the microphone preamp. The preamp is activated when the switch is in the forward position. 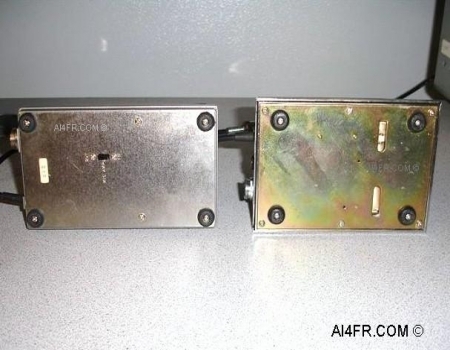 Hamfest tip: As we wind our way through hamfests and flea markets, some times it is not possible to take apart the merchandise from a seller in order to learn which accessories have been installed in a particular item, or just what version of the item it is that we are contemplating buying. So how would one know if the seller has an MC-60 or an MC-60A? A quick and easy test to tell the different between the two is that the MC-60A will have the preamp switch as seen above in the picture on the right, while the MC-60 will not. These next two photographs are a close up of the microphones with the bottom cover removed. The MC-60A is on the left and here we can see the battery compartment and internal circuitry. The MC-60A does not need the batteries for operation. The batteries are only needed if the operator plans on using the built in microphone preamp. Some of the newer Kenwood radios actually recommend not using the preamp at all. This microphone preamp is activated by an On/Off switch located on the bottom of the base and requires 2 double A cells for a power source. Kenwood recommends against the use of NiCd or nickel cadmium rechargeable batteries. The radios with power available at the microphone connector(for autopatch microphones) will not require batteries. Important, when the preamp switch is turned on power is always on. Kenwood has done this so that the microphone or should I say preamp may be used with VOX operated equipment when no microphone keys are pressed. That means when you are done operating, turn the switch off as the preamp will still draw up to 1 ma of current and slowly discharge the batteries even while you and your radio are taking a break. 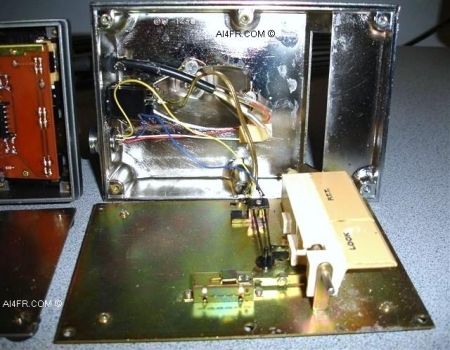 The photograph on the right is of the MC-50 with the bottom cover removed.